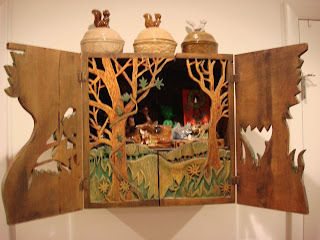 This is a wooden cabinet that Bob made in art school, so technically it's not really vintage but it does house a bunch of the breakable tchotkes that we like to keep away from the kiddos. Truthfully, a lot of the mismatched mid-century occupied Japan porcelain critters that I once loved to collect are boxed up until Jasper and Roo are old enough to live with them without trying to eat them or throw them. 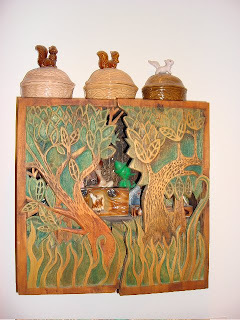 For example, the huge array of Holt Howard salt and pepper kitties that used to live in a straight line across my mantel. Too breakable! I love the squirrel/nut candy dishes, though. It's hard to pass them up at yard sales and thrift stores. They look pretty cute en masse. Aren't the carved doors of this cabinet gorgeous? I think Bob would make a mint if he sold them on Etsy. But no one asks me. 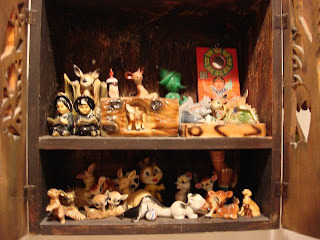 Inside the cabinet, a disarray of orphaned wildlife and some of my moderately offensive coolie figurines. 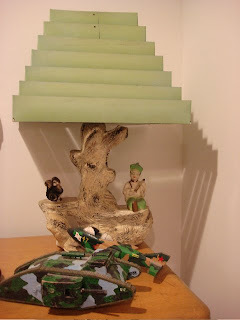 And a green plastic Pinocchio. And the weirdest Mexican souvenir candlestick, ever. It's a hand holding a leg. Also upstairs in our bedroom, more kitschy Asian-y goodness and a couple of super cool wooden military vehicles that Bob's dad made for him when he was little. Here's who we're keeping all this junk away from. Sure, he looks peaceful enough. 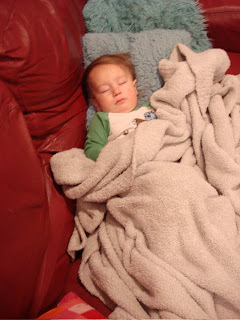 But he's napping on the couch instead of his crib just so he can keep tabs on me. What's up with that?! Holy crap! Bob could be paying your mortgage from Etsy. Oh my goodness Naomi! that cabinet is GORGEOUS! I want it. or one like it. My step dad is a carpenter and there is a huge family business, doing church pews and school cabinets etc. really gorgeous stuff, so yes Bob could make at least a mint! and I will be first in line! (well since I commented second maybe second! Message to Bob--sell those cabinets! I'll bet you could make at least $1000 on one. But we artists know that it's often not worth the time. My mother in law has many of those figurines. One of them is a big squirrel that sits next to the fireplace and is always taunting Soren to smash it. My father in law wishes that would happen. I want to snuggle with Jasper too! It would give you a break. Wow Naomi. I just love all your little treasures in that gorgeous cabinet. Holy moley. Does he not like to carve any longer or hey, why isn't he on Etsy? And you are so wrong. I love the way you have the army vehicles displayed. Do you like to play with the toys as well? What a beautiful cabinet!! And yes - he would make so much - I can't believe he hasn't. How neat.